When you score Profiteering, take up to 3 bad publicity. Gain 5credit for each bad publicity taken. It was surprisingly easy to make creds…if you didn't care about how you made them. Long story short. 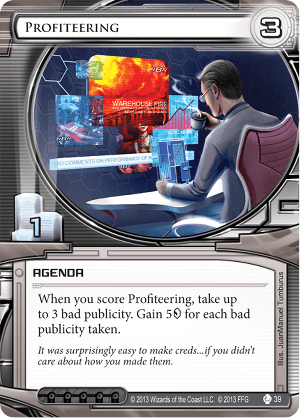 Profiteering is not a good economy card and a terrible agenda, but it is a burst economy card without peer, it can enable you to pull off expensive stunts a few turns quicker then normal. The trade-off is that it has risks whether you manage to score it or not. It is the tempo opposite of Gila Hands Arcology. At first I considered Profiteering to be an inefficient agenda. A 1 - 3 that may net you up to 15 and 3 bad pub. It inflates agenda density, costs 3 and 4 to install and score for a "gain" of up to 15 an 1 agenda point, in return the runner gets +(1-3) per run for the rest of the game. I thought this was bad, it is bad. If you use this thing to net yourself 15 youve spent 3 and 4 (easily worth another 8 credits for a total estimated cost of 11 credits) and in turn the runner gets 3 free per run. A very bad track record compared to a rather similar agenda Geothermal Fracking. However, this card is still not useless. It can get you from 3 to 15 in one turn. Kickstarting you from a weak position. Whether you just lost most of your starting credits to Account Siphon or were forced to spend too many to protect an agenda flooded HQ Profiteering might have you covered. It synergizes with Restructure, the burst will enable you to play Restructure quicker then otherwise possible. The huge flux can result in you rezzing impractically expensive ice such as Wotan, Janus 1.0 or Heimdall 2.0 and you would still have left. Profiteering synergizes with strong pieces of ice that on their own are taxing enough to run through to trivialize the bad pub. A very notable synergy is Archer, you can gain a huge economic advantage by scoring this agenda and then sacrificing it for Archer, the Archer more then makes up for the bad pub with sheer tax, even if the Archer winds up targetted by Femme Fatale it will still cost 4 to get through it. Profiteering compares interestingly with other burst econ cards. Hostile Takeover gains you 7 and 1 bad pub for 3 and 3. Less then half the of Profiteering but at a much lesser bad pub cost, and is scorable from hand. Geothermal Fracking gains you 14 for 5 and 4, the bad pub is flexible in this case because it does not kick in until you decide you need the , however it is very slow to score. Melange Mining Corp. nets you 14 for 7 and 1, it has the risk of being trashable but that is a negible downside compared to Profiteering being an agenda. More importantly Melange Mining Corp. has no bad pub. #Melange is also re-occurable via some pretty cool cards like Architect or tutorable quickly via Tech Startup. The most important comparison is that Melange Mining Corp. is MUCH slower due to the heavy investment. The main problems Profiteering has are that it's essentially an economy card dressed as an agenda. It has 2 risk factors, first that it can be stolen, second that it gives bad pub. Compared to econ cards it is slow and benefits the runner as well as yourself. Compared to agendas it's just a 1-pointer. If you dont have an opportunity to use and abuse the advantage you can score it and take no or just 1 bad pub. 5 back for scoring it isnt bad for an agenda and worth taking 1 bad pub. Install it round 1 behind cheap ETR and an Archer on R&D or HQ, if it survives the round youll have $ to seize the early advantage and feed to rezz Archer with.